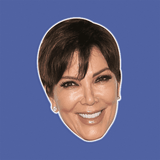 Backstory: Do you keep up with Kris Jenner of “Keeping Up with the Kardashians” fame? Don’t let her relationship with the Kardashians fool you—this savvy businesswoman owns and runs her own production company, known as Jenner Communications. Do you realize that she’s one of the major factors that has kept her daughters (including, yes, Kim Kardashian) and son in the spotlight? Although many people relate her fame to her two famous spouses, Kris Jenner runs this show. If you’re sick of hearing about the Kardashians, Kris is the frontrunner of why they’ve managed to stick around in the public eye for so long. 🤩DON’T JUST WEAR THE CELEBRITY, BECOME THE CELEBRITY - If you're sick of hearing about the Kardashians, thank Kris Jenner. Look like this famous businesswoman at parties, concerts, and Halloween.